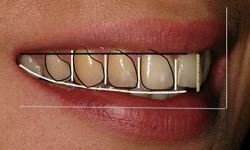 Our Smile Makeover Process is designed and created based on your needs and budget. Whether you want to improve or restore your smile, we’re here to give you a smile treatment that’s right for you. Take the first step towards having a confident smile with us and understand our process. At The Perfect Smile Studios, we pride ourselves in delivering high levels of patient care. We fundamentally believe that a strong, healthy mouth is the perfect foundation for a new smile. Every Smile Makeover treatment we design is overseen by a member of our experienced team of dentists. With over 2,900 Smile Makeovers, we’re here to give you the smile that you want. Throughout the Smile Makeover Process, we’ll keep you well-informed and detail every treatment that we believe is necessary to achieve the smile you want. Our free consultation allows us to understand what you want. Below is our complete Smile Makeover Process Guide that details every step we take when creating your treatment plan. We begin the Smile Makeover Process with a series of complimentary digital photographs. 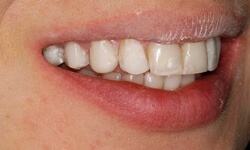 Our photographic smile analysis gives us an invaluable insight into your current teeth and mouth. With our extensive portfolio of before and after makeovers, we can compare your smile to previous ones. This is also an opportunity for you to ask us questions for further information on your current smile. After our photographic smile analysis, we’ll begin to generate computerised smile images. During this process, you’ll be able to see various smiles depending on the treatment used. The computerised smile images allow you to have a visual representation of how your smile can be improved. You can find out more about our smile imaging designs by booking a complimentary consultation. Our mock-up smile designs are handcrafted artificial teeth that give you an idea of treatments. This innovative technique allows you to properly visualise your teeth before committing to further treatment. The mock-up smile design acts as a foundational template for further cosmetic treatments. 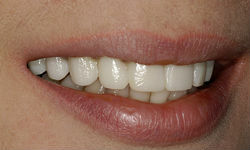 We can use the mock-up smile to get a glimpse of veneer, teeth straightening and bonding treatments. The digital smile design gives us greater control of making changes and offering choices on the smile you want. We use a non-invasive intra-oral scanner that processes the inside of your mouth in high-definition. 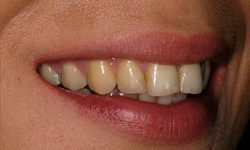 This gives you a preview of what a Natural or Hollywood smile could look like for you and what treatment you may prefer. We believe this process is vital as we can carefully review your expectations and deliver the results you want. Our trial smile is a provisional temporary smile that is placed onto the prepared teeth, giving you a final opportunity to test your new smile. By using the digital images taken beforehand, we can craft a natural-looking smile for you to try before committing. The trial smile is created by your dentist and gives you the chance to make any changes or suggestions before treatment. If you’re happy with the trial smile, we’ll begin carrying out your treatment. After deciding on the smile makeover you want, we can begin creating it with various cosmetic treatments. Your dentist will then take the steps necessary with the treatments agreed beforehand. This can include: Crowns, Bridges, and Dental Veneers. The length of treatment can depend on the smile makeover you’ve opted for and the cosmetic treatments needed to complete the makeover. Our digital smile design software helps us plan the treatments you need to get your smile in the shortest time possible. Using top brands like Lumineers veneers and Invisalign braces, we can create the smile you’ve always wanted, virtually pain free. This inevitably leads to the creation of a smile that is very natural looking in shape, form and function. Enhance your smile with our advanced treatments. Find out more. Restore your natural teeth or choose life-like porcelain veneers. Veneers create the illusion of a beautiful, healthy smile by correcting misalignment, closing gaps and masking discolouration. The famous Hollywood Smile is guaranteed to get you noticed. 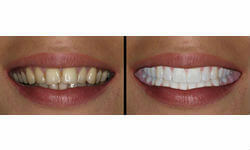 We transform your teeth into a dazzling, uniform, bright white smile using minimal intervention for maximum results. No need for costly repeat visits or lengthy procedures. Get pain-free smile perfection in as little as two visits with instant veneers.